The other day, I borrowed tablet from my brother to browse internet. As soon I entered a URL in Android’s Google Chrome I was greeted with the error, “Your connection is not private”, I was confused because the tablet was brand new and running stock Android 5.1 Lollipop with no additional apps. But anyhow, I managed to fix the problem, it wasn’t tricky but it took me a while to fix it. Grab your Android phone/tablet whatever. Or optionally, you can set time by yourself, just make sure it is correct. Try changing WiFi connection on your device. Public WiFi hotspots are insecure and prone to hacking attempts. Hackers can monitor internet packets on WiFi and decrypt SSL to steal your passwords. If you have installed any Anti-virus or security application on your Android device. Temporarily disable them and start browsing to see if error is gone. This would be your last resort, it will revert your device to default settings, all your SSL certificate issues will be fixed. If you are going to do it, just be sure to have a backup beforehand. And it includes one of the following error codes, I give you an insight about these errors. NET::ERR_CERT_INVALID – It means, you cannot use HTTPS because SSL certificate on server has been expired. 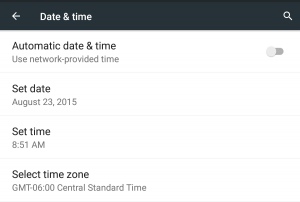 NET::ERR_CERT_DATE_INVALID – It means you have incorrectly set date and time and your Android. NET::ERR_CERT_AUTHORITY_INVALID – It means the SSL certificate issuing authority is unverified. NET::ERR_CERT_REVOKED – It means the SSL certificated has been blocked by issuing authority. HTTPS allows encryption of data (URL, text etc.) between User and the Server machine so, it reduces risk of data theft and man in the middle attacks. 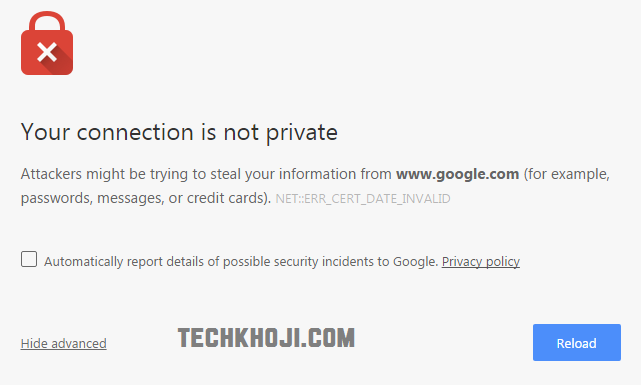 Privacy Error, connection not private these types of error come when SSL certificate used by Server is expired, poorly configured or invalid. Websites that use HTTPS SSL have green lock icon right on the left side of address bar in Web browser. Thanks for posting this. Solution #1 fixed it for me. Why would not having auto date & time checked give such a scary error message? Thanks so much!!! I got a new SIM card and none of my google apps were working! Its all good now, thanks! I had the very same problem with my Nexus 7. When trying to use the free WIFI at Sainsburys. From Chrome browser. On opening WIFI the Sainsburys Web page should have displayed. But came up with the SSl error. My fix was to download an alternative browser Puffin from the Android Play Store. a ssl certificate downloaded automatically. The internet worked 100%. rebooting chrome browser worked fine. Thank you very much – solution 1 solved it for me. So simple and I had spent DAYS trying to sort it thinking that it was synch problem in Gmail (which was not working at all). Brilliant. I am getting this error NET::ERR_CERT_AUTHORITY_INVALID on MI & Moto phones, rest all other devices/browsers (IPhone/Samsung android/Windows) are showing the green lock icon only. The problem is, I’m at a hotel and the opening “splash page” asks for your name and room number, so the Security thinks someone is trying to get your data. It wont’ even let me move past this to the page, so I can’t get online to (a) load any new browser that doesn’t have security or (b) reach any other webpage. 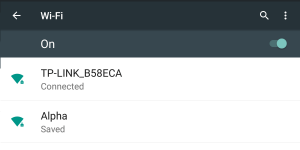 Play Store says WiFI and data aren’t available, although I am on my network here, so I can’t get another browser via the phone service… Too bad Google doesn’t allow you to shut off this security temporarily OR allow you to move onto a page and take the risk yourself. I HAVE THIS PROBLEM PLEASE HELP !!! Thank u so much, Solution 1 i.e “Correct Date and Time Settings” worked for me well. Thanks a lot. Solution 1 and 2 worked out. I solved this by giving chrome for android the middle finger and installed firefox and uninstalled chrome. It only happened when I would try to connect to a wifi that required a login (such as at Starbucks or at hotels) and I was at my wits end. I had to clear data, but not all of it. I just cleared cache and it fixed the issue. Hey, I get this eror on Android ERR_CERT_AUTHORITY_INVALID, but on PC, theres no eror, everything is PERFECT on PC. Help? Thank You so much!! You’re a genius. Btw, are you a japanese? Because the name you gave to your website is so cute. This NET::ERR_CERT_COMMON_NAME_INVALID error is absolutely maddening! I am getting this on my new Pixel XL phone. I’m currently at a hotel and trying to connect my phone to the hotel wi-fi. This error blocks every attempt I’ve tried. I am so sick and tired of reading blogs which refer to time and date. How many folks really have that problem?! I checked – mine is set to update automatically. So that’s not the issue. And I am able to connect to the hotel wi-fi using my MacBook Pro and my iPad. I really wish the Google folks would fix this silly and very annoying error. I’m tired of Windows or Android or Google (or whomever is in charge of these things) treating “NET::ERR_CERT_INVALID” “NET::ERR_CERT_COMMON_NAME_INVALID” and “YOUR CONNECTION IS NOT PRIVATE” types of errors (and many similar) as a slight nuisance:and something we must just live with. I’ve tried many posted “solutions” but the problems continue to come back. Clearing the cache was my first try and didn’t fix anything. Resetting may be the only solution…but….will even that work?.